For mass audiences, acceptance of special effects and acting styles are generally confined to particular decades. The only reaction the puppet bats in Tod Browning’s Dracula would get from a modern teen crowd would be laughs. The same goes for the histrionics of the cast. Yet the mood of the movie, the dull creepiness that pervades the shots of Castle Dracula and the simple yet forceful presence of Bela Legosi transcends the shortcomings of the era. Legosi emanates evil, despite the amateurish eye-lighting and the mistimed closeups. A masterful performance such as his can make a movie worth watching on its own – but Legosi is not the lone bright spot. The dynamic Dwight Frye (probably best known as Frankenstein’s assistant ‘Fritz’) as the lunatic Renfield brings an invaluable spark of life to an otherwise down-toned story. 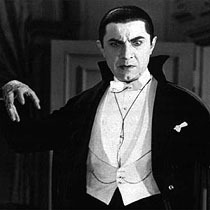 His wild eyes and crazy – yet controlled – voice give validity to Dracula’s power. The power of suggestion is one of Dracula’s strengths, but it is also the linchpin of early horror pictures. Without computer graphics or advanced techniques, a monster could wreak only so much havoc on screen to elicit an audience response. Instead, what evil has done or could do is emphasized, letting the imagination do its worst. We never see Renfield actually bitten – we see Dracula descend upon him. We never hear Dracula’s voice speaking in Renfield’s mind, or see his visions. But we first see Renfield as a normal business man, and then we see him crazed and creepy, laughing hysterically or quivering at Dracula’s command. This is what Dracula can do. In a very real sense, Frye’s performance is the foundation for Legosi’s. Without it, Dracula’s threat would exist almost entirely in exposition. This version of Dracula laid the groundwork for a lot of horror’s development, but it also stands strong on its own. It is surprisingly entertaining and worth a look if you get the chance. It is currently available in “Watch Instantly” on Netflix. This entry was posted on August 29, 2010 by Ian Kay. It was filed under Dracula (1931) and was tagged with dracula, legosi.